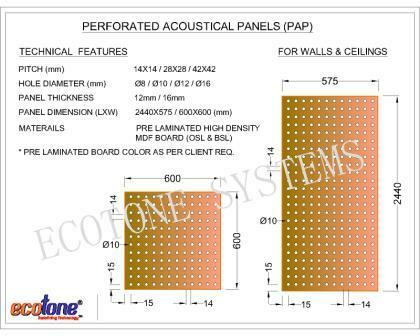 Ecotone Provide Perforated wooden slats, Wooden Acoustic Tiles & Wall Panels Manufacturer, wooden perforated panel combines the best of aesthetics and sound absorption. ECOTONE™ wooden perforated panel combines the best of aesthetics and sound absorption. ECOTONE™ can provide perforations / slots based on your style / design needs. Perforated wood paneling offers a rustic look to almost all building structures, such as auditoriums, offices, gymnasiums and concert halls. Wooden perforated ceiling panels control sound reverberation and improve sound quality. ECOTONE™ perforated wooden tiles are available in different perforation patterns but we also offers designs as per clients / architect choice to give a different office look which will be different from that of a music hall. ECOTONE™ wooden perforated tile control reverberations and give very good aesthetic look. 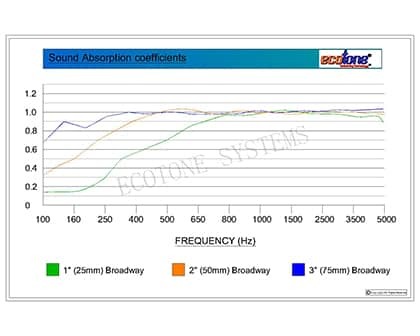 ECOTONE™ Perforated panels offer absorptions spanning a variety of sound frequencies. M and T perforation panels effectively absorb frequencies in the low, medium and high ranges.